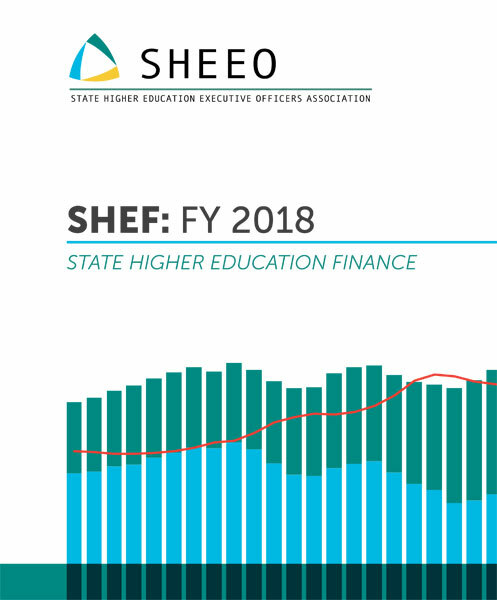 SHEEO, the State Higher Education Executive Officers Association, recently released its annual State Higher Education Finance (SHEF) report with an in-depth look at funding for higher education systems nationwide. This sixteenth finance report is significant because it marks a ten-year benchmark since the end of the Great Recession and highlights the fact that, as in FY 2017, the majority of states rely heavily on tuition dollars to fund their public systems of higher education. The report draws on quantitative data from state and local sources and incorporates educational appropriations, net tuition revenue, total educational revenue, and full-time equivalent enrollment (FTE). As context, the report points out that support for higher education has traditionally been the third largest major budget area of state spending from state and local tax sources, behind K-12 and Medicaid appropriations. In FY 2018, 9.7 percent of state general funds were allocated to higher education, down from 12.9 percent in 1995. All state and local revenue sources, including those from taxes, lottery receipts, mineral and resource extraction revenue, and state-funded endowments are included. Historically, state funding for higher education “acts as the ‘balance wheel during economic downturns,” according to the report, with greater funding reductions than in other budget areas because it can be offset with money from tuition increases. The report also highlights the fact that in FY 2018, following five years of growth in state and local support for higher education, there was no national change in per-student support for higher education. Appropriations per FTE remained flat in 2018, increasing by just 0.2 percent after adjusting for inflation. Significantly for families with college-aged students, state financial aid for public higher education institutions rose in FY 2018 for the fourth straight year. Tuition revenue at state higher education institutions also remained flat and did not significantly exceed the rate of inflation. The report indicates that FTE rates declined in 35 states and Washington DC last year and attributes this fact to the recovering economy. Along with these national trends, the report also highlights the variation that exists between states and includes a range of tables and graphs to enable comparisons. For example, while state funding remained flat nationally, the report notes that in 22 states, funding actually declined. In addition, 11 other states have seen no recovery at all. Only nine states have met pre-recession funding levels, according to the report. Although most states protected student financial aid during the Great Recession, 28 states have actually increased per-student state public aid since 2008. Researchers made adjustments in their data collection strategies to allow for differences in cost of living and enrollment levels across all states and higher education institutions as a way to standardize all of these data sources. SHEEO recently received a three-year grant from the Bill & Melinda Gates Foundation to refine and improve the SHEF Report. By next year, the SHEF will likely look very different—with an accompanying interactive website and new data visualizations tools to make it easier for readers to synthesize all of this complex data. Is Living Paycheck to Paycheck the New Normal for Middle-Class America? A nonprofit advocacy group’s study confirms what the federal government shutdown made plain for all to see: Tens of millions of Americans who consider themselves “middle class” are only one missed paycheck away from poverty.